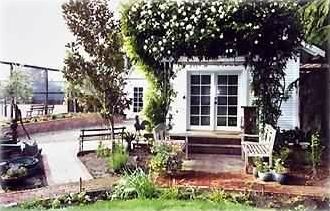 Clark's Little House is a detached, private cottage in a country setting one-and-one-half miles east of Sonoma Plaza and near several wineries. The cottage features over 380 square feet of living space plus a 200-square-foot, private, redwood deck. The bedroom has a queen-size bed and the living area includes a pull-out twin. Both have many antiques, crown moldings, cottage windows, ceiling fans, natural gas fireplace, three sets of French doors, and hardwood floors. The bath has a claw-foot tub, a separate shower, and a marble and granite floor. A private tennis court is on the property and available to guests. Amazing get away! Everything was perfect! They even had wine waiting for us! Awesome host! Thank you so much for the fresh flowers and the wine and coffee... I would come back just to stay here! Great place to stay. We enjoyed our stay and were very comfortable. Would stay there again. Hate to leave this cottage. Great experience for our first time in the area ! just what we expected from the site photos and actually more. there are tennis courts, rackets and bikes that we did not have time to use. all the comforts of a basic stay away from home. it is a light filled cozy apartment with pretty furnishings, clean, cozy bed, hot shower........the neighborhood is nice and quiet .it would be an easy lovely walk or bike into town. thank you for a terrific visit. Very nice and quiet property. Only issue we had was WiFi and tv /cable didn’t work. So sorry about the wifi and tv. We were not aware of the problem and could have re booted the router in our house or the booster unit closer to the cottage which usually is what is needed. Hope you stay was comfortable in spite of the situation. We have loved being in Sonoma and have enjoyed this perfect retreat. The cottage is well located, very private and comfortable and there’s lots of outdoor space to take advantage of in warm weather. We hope to return to continue exploring the area. What a lovely area!! Located one and one half miles south east of Sonoma Plaza.